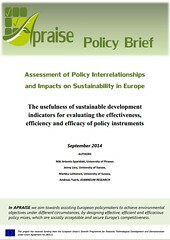 The 2nd APRAISE Policy Brief provides a thorough analysis of the role of sustainable development indicators for evaluating the effectiveness, efficiency and efficacy of policy instruments. It also offers an assessment on their usefulness in answering research questions related to the issues addressed by APRAISE. The Policy Brief is available here. The APRAISE Synthesis Document presenting the results of the APRAISE 3 years of operation has been released! The APRAISE Synthesis Document is available here. 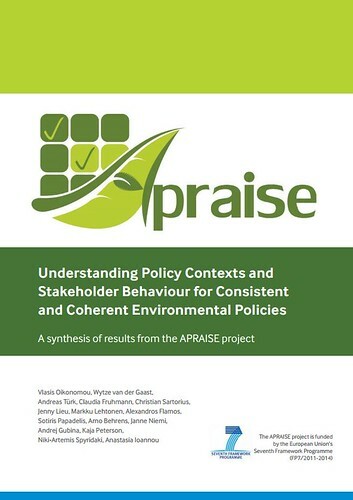 The 1st APRAISE Policy Brief “Accounting for Unanticipated Effects of Environmental Policy Making” provides means towards the extension of the APRAISE 3E Method, as the method could benefit if the unanticipated effects which occurred during the implementation of the case studies, were examined more systematically. It provides concrete steps towards the extension of the 3E method, emphasizing the inclusion of stakeholders as a crucial precondition for a legitimate and successful evaluation of unanticipated effects. The 1st APRAISE Policy Brief is available here. Within the framework of the APRAISE Summer School, implemented on the 25th – 29th August 2014, in Ljubljana, Slovenia, an APRAISE Synthesis Document was implemented and disseminated to participating students, in order to get more familiarized with the project. The APRAISE Summer School Synthesis Document is available here.